Our brand new set of Late-war Soviet Decals offers a great deal of variety to anybody building a Soviet Flames Of War force. This set contains four different sheets covering many types of Soviet vehicle markings. Sheet 1 comes with a selections of two digit serif font number, great for anything from T-34 tanks to heavy IS-2 tanks and ISU assault guns. On this same sheet you will find some Polish Eagles for those of you interested in modelling your T-34 tanks as those operated by the Polish forces raised by the Soviet Union. 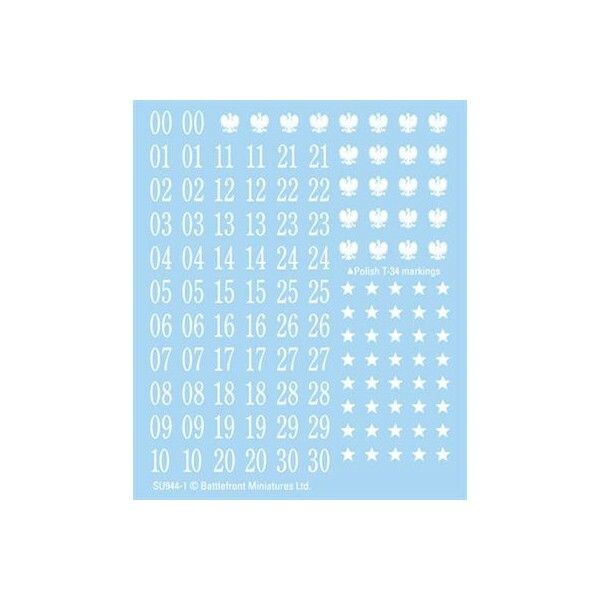 The third element of this sheet are white stars, which were often used instead of red stars. Sheet 2 comes with smaller serif font numbers arranged in four digits. However, you can always slice them up into two or three numbers if you desire. This sheet also included five different slogans for placing on tank turrets or assault gun hulls. 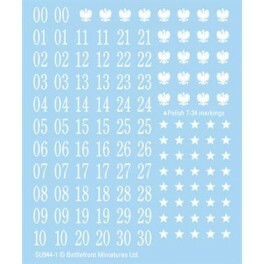 The finally option on this sheet are some diamond shaped tactical numbers, which are sometimes found on the sides of tank turrets and other armoured vehicles. Sheet 3 is covered in multiples of 12 different slogans, giving you plenty of variety. The final and fourth sheet comes with two different sized red stars and guards badges for putting on your tank turrets.